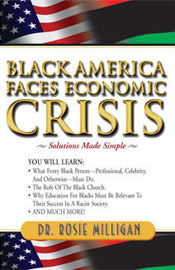 Black America Faces Economic Crisis is a wake-up call for the multitude of comatose African Americans. If you think that Bill Cosby was “in your face,” after reading Black America Faces Economic Crisis, you will discover that Cosby was nowhere near your face when compared to Dr. Rosie Milligan. She dedicates an entire chapter examining examples of STUPID things that Blacks do. She backs the STUPID behaviors with facts that will not yield a hung jury—but a guilty verdict of STUPIDITY. As angry as you may feel because of how she strikes Black America with her pen, this is a book that you cannot afford to ignore—your economic future and your children’s economic future is dependent upon your taking heed to her “Master Salvation Plan” for Black America. Wake up, America, it’s the season for change.